This individual Report Opportunities for Growth in US Credit Card Issuing is available for purchase. This Report is available to members of Mercator Advisory Group’s Credit Advisory Service. Please be advised that this Report is normally part of a research and advisory service that provides ongoing support throughout the year. As such, this Report contains significant depth of content that is selected for its strategic importance to our members. (For a description of these services, see our Advisory Services section). Much has been written about the declining growth rates of credit card receivables in the US. In both 2003 and 2004, annual growth rates were near or below 5%. 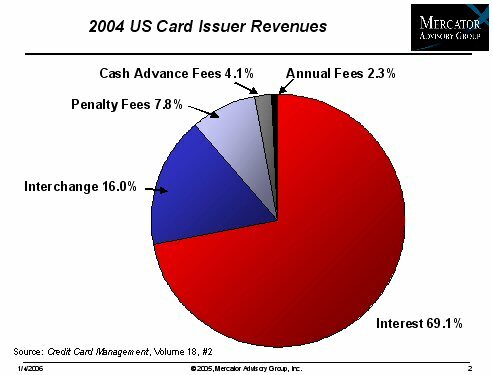 In previous reports, the Mercator Advisory Group has expounded on the effects of this slowing on the card issuing industry as well as on the broader US and Global banking businesses by extension. Mercator has also discussed a variety of alternative strategies and products for improved profitability, including corporate cards, prepaid cards, and new systems to improve operations. This report approaches the issuer from a different perspective: what can issuers do to make up for slowing loan growth? Despite the slowing of the industry's core profit engine, opportunities still exist in the US Consumer Credit issuing space. There is plenty of fertile ground for US card issuers to explore, both in growing their charge volumes, and in reviving their slowing growth rate. Interchange revenues are becoming an increasingly important part of issuers' businesses, although they still make up a relatively small share as compared to interest (Figure 1, below). While growth has stalled, charge volumes continue to grow at double-digit rates. By winning recurring bill business from cash and checks, and micropayments from cash, issuers can continue to grow these volumes and their interchange revenues at healthy rates. This report contains 28 pages and 8 exhibits. New products offer promise as well, and issuers continue to innovate at a rapid rate. Hybrid cards have taken a dramatic leap forward and are set to become a significant piece of the consumer card business. Rewards programs also remain a fertile ground for innovation, with new and different ways to refund money to cardholders appearing all the time. And, finally, there are a plethora of foreign markets that offer great promise to issuers. Flush with bold ambition and bulging coffers, US issuers are ready to tackle Europe, Latin America, Asia and beyond. The core of the card business may have stopped growing rapidly, but this report contains plenty of good news for issuers: there is still growth out there; it is just in different places than before and might just be a little harder to find.